Yes, and a strange question that is. But actually not an unrealistic question. 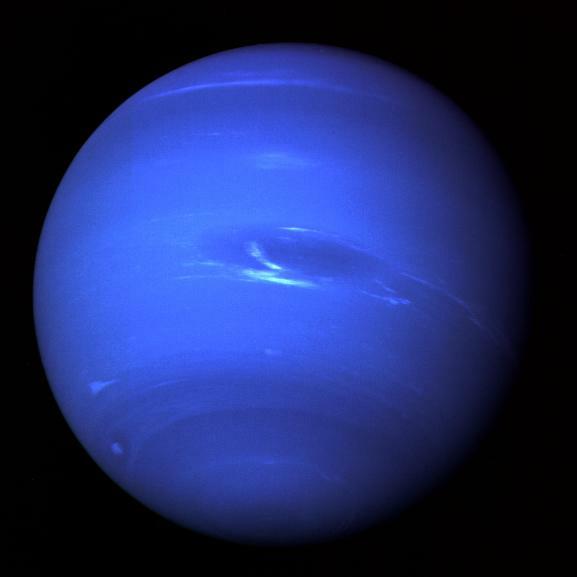 Neptune, now the farthest true planet from the Sun (after Pluto's demotion), is namesake to the ancient god of the oceans. Neptune is shrouded in layers of icy, dense air laced with enough methane to color the world azure blue... hence the world's maritime label. But despite its pelagic associations, Neptune has no oceans... though it might have had, with a slightly different composition. And it's very possible that Neptune will one day be covered in a deep, wine-black sea of cool, liquid water. Neptune is a big world, about 49,530 km in diameter, but despite being sometimes referred to as a lesser gas-giant, it's not a colossus like Jupiter. It's not even mostly gas. The sphere we see from outside is only the top of a deep, thick atmosphere. About 20% of Neptune's apparent diameter is air, mostly hydrogen and helium, but with a fair tincture of methane and ammonia, and some more complex organics at trace levels. As one dives into Neptune the outer air starts off very cold. The planet is 30 AU from the Sun, after all. But inside Neptune the heat rises with depth... along with pressure. At a depth where the air is about as dense as what you're breathing, the temperature is about -200° C, or ~70 Kelvins... but by the time things warm up to room temperature - around 300 Kelvins - you'd be crushed by over 50 atmospheres of pressure. One of those deep-diving suits from the old movies would be required to survive (along with oxygen tanks, of course). Below that, things get weird. I said there's no ocean on Neptune, but there is something like an ocean. As pressure climbs during your dive into Neptune, the atmosphere would gradually thicken into something very much like a liquid. True liquid water can't exist anywhere inside Neptune, because there is too much hydrogen. The hydrogen molecules shove their way in amongst individual water molecules so much that water can't fully condense into a true liquid. But at the crushing pressures of Neptune's interior the thick, hot H2O, H2 and He gas compresses to water-like densities... except it's not liquid water, and the temperature is over 2000° C. Those temperatures are hot enough to melt iron, and are far too hot for any organic compounds to survive. It is decidedly not an abode for life (as we know it, I must add with geeky circumspection). But what if all that dense quasi-fluid were cooler? Neptune generates 2.6 times more energy in its core than it receives from the Sun, mostly from radioactive decay in its rocky heart. Really, "core" is an odd word to use, because this rocky kernel is more massive than four Earths. For all we know it might have an adorable little metallic iron core all its own, about the size of ours. In any event, heat from below combined with the thin solar light at 30 AU keep Neptune's water from condensing as rain. But... if Neptune were colder at its cloud tops, and cooler within, its water could drop out to form a massive ocean realm. What would such a realm be like? Half the planet's apparent diameter is currently a hot, ionic quasi-liquid right now, but cooled that material would condense into an ocean thousands of kilometers deep. As a comparison, the Mariana Trench is the deepest part of our ocean, at 10 km. Neptune's ocean would be hundreds of times deeper, and much stranger. If Neptune had a water ocean, its floor wouldn't be rock, it would be solid ice. Heavy ice... ice VII, or X, or XI, or some other weird crystalline water-lattice that can survive at ten million atmospheres of pressure. Heat would rise from below, from the imprisoned mass of searing rock in Neptune's center. Volcanic heat from the core mass would bubble up, melting the icy oceanic crust, and inseminating the deep ocean with precious minerals. Could life exist in such an alien environment? Maybe. If Neptune could cool enough that it supports a liquid ocean, it might also give birth to life. Only when its massive, world-girdling ocean cools to become normal water, instead of a seething ionic mantle, will the conditions be even remotely similar to what conventional life requires. The big question, of course, is... can that happen? The answer appears to be a qualified yes. Eventually, when its interior furnaces wind down a bit, and its atmosphere can cool enough, seas become possible on Neptune. The only problem... and it's a fairly big problem, from our perspective... is that before that can happen the Sun has to go away. Specifically, the Sun must live out its long, long life and ultimately wither into a fading white dwarf. The post-solar white dwarf must, in turn, fade from blazing incandescence to a dim sputter. At that point, tens of billions of years from now, Neptune will cool enough to bear oceans. But not until. There are two ways of looking at this news. From a purely selfish point of view, I'm quite cross that I'll never be able to see what titans of the deep Neptune's olympian waters might birth. But from a larger perspective I'm encouraged. Even when the Sun goes dark, it will be possible for life to spawn... or transplant itself and survive... in our solar system. The details will differ from what we're familiar with today, on Earth, but water in the dim astronomical future will still require fins, and streamlining, to move through, and the animals of any Neptunian ocean of 100 billion years from now will still need to be sleek and smooth and tapered. I don't have to see them for myself, because I can use chemistry, thermodynamics, geology, and physics to construct a probabilistic prognostication. Or two, or ten... There are many ways the future of Neptune may work out, but among them are highly realistic ways that lead to life, and complexity, and possibly thought... in a future so deep our own biosphere will be an impossibly ancient memory from a time older than the Big Bang is to us. Now, show me that in your Book of Revelations. Thanks, Nano. Enceladus is one more thing on my list to blog about, as it happens. Yes, the water geysers there are a dead giveaway for liquid water in the interior... that's pretty much accepted now. There are some good scientific papers that discuss the possibility of life there. I have my doubts, though. Liquid water is a necessary but not sufficient condition for life. Another is energy, and Enceladus has some interior heating due to tidal flexure, so that's a good sign. But I think there might not be enough metals there. Specifically, enough phosphorus. What people tend to forget in discussions of "carbon-based life" is that C is only part of the laundry list. Building RNA and DNA requires phosphorus (P), and the principal energy currency in the cell is ATP, which contains P. Cell membranes on Earth are made of phospholipids... fatty acids with a P attached to each molecule. Enceladus is mostly ice, with little rock. I doubt there's enough silicate there to contribute the necessary P.
Actually, yes... or rather, maybe. Among the 300-odd planets that have been found so far circling other suns, a number of them are so-called "super Earths"... planets having 5, 10, 15 or so Earth masses. Worlds like that probably have a lot of water, as Neptune and Uranus do. Some known worlds are "hot Neptunes" - big worlds circling close to their stars - and some of those might have water oceans now. We don't know yet, but that's an active area of current research. Wew! Interesting, but not sure what I will ever do with this information. Do we have any information about planets elsewhere that probably does have water at reasonable temperatures that exists now? Wonderful!! Extremely well thought out and presented. I love Sci/Fi, and when there is a logical, within-the-relm-of-possibility scenario, so much the better. Yes...what a shame we won't be around to see it. The book of revelations isn't. It was written by a hermit weirdo who probably had temporal lobe epilepsy and dined on moldy bread way too often......just my take.....no one has to agree.